As in every family and in every situation, we try to find out whatever fits. 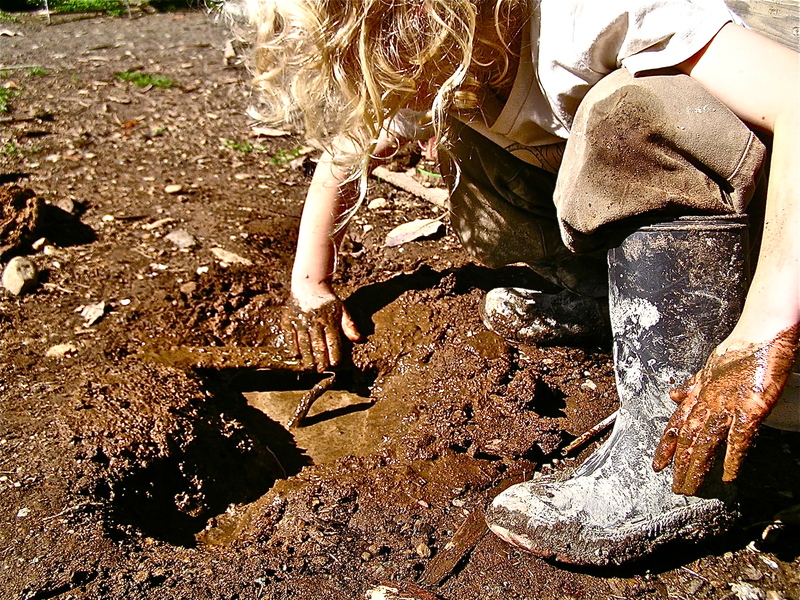 Our decision to homeschool our children came from the ideas that in today’s current public education system, children do not have the individualized freedom to really find their true unique qualities. Colin and I both felt that our own experiences within the school system led to difficulties later on that we have struggled with, and since the system doesn’t seem to have changed much, we wanted to offer something better for our own children, an environment that gave them the freedom to dive into whatever captures them without a time limit or a separation of subjects and age grouping dynamics. I am not wanting to generalize, however, on the many schools out there and the many different experiences that can be created. Negative experiences can happen to homeschooled children as well, and certainly, the ignorant seem to like to repeat the horror story of someone’s hidden away, repressed child to us when we tell them that we are a homeschooling family. There are round holes and square pegs, and square holes and round pegs and everything else besides. It is a new classroom that can teach to the individual needs of children, and for us, the classroom of our home works to meet all of the shapes of our gifts. 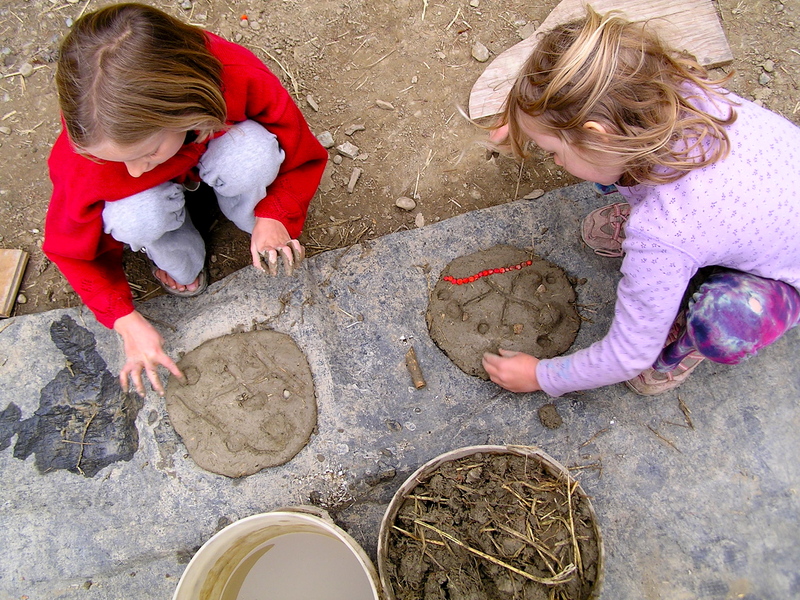 We have a unique program for homeschoolers on Pender Island, one that was created by a group of parents when my oldest (Taeven) was entering her kindergarten year. We wanted to create an alternative for families to consider, and out of that came Spring Leaves Family Learning. In collaboration with our local elementary school, we were able to acquire a teacher/facilitator, a space to use in the school one day a week for our own organized (and optional) activities, and the use of the gym, the library, and the kitchen. We certainly have had some issues to work out along the way since we are working within the boundaries of the greater education system, but as we enter our fourth year we have expanded to the enrollment number of 21 kids, and we have created a day of focused learning for our now “older” kids, the ones who were in their primary grades when the program started. As a group, we organize different activities to do together on our day at the school, or we take the group on field trips both on and off our island. We have had community members come in and teach, we have had grandparents attend and help out, and we have had other teachers in the school peek in at our activities. We are most grateful to our teacher/facilitator, Julie Johnston. She has been working to create a resource of information and inspiration to update the current education curriculum to reflect the changing needs of our societies and our environment. Her passion for the outdoors and natural, child led learning is refreshing and highly reflective of all our learning directives. Please take a look at her site….http://www.greenhearted.org/. It is an indication to me of the dedication she has towards making education more sustainable for the earth, and for all living beings that depend on it for life. 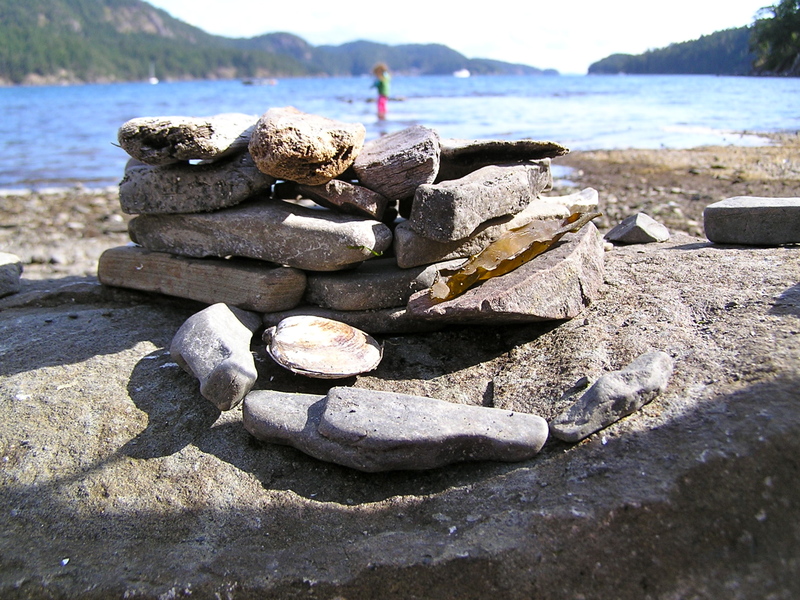 She sees engineering in a stack of beach stones. She sees physics in the discovery of maple seed helicopters. She celebrates the fact that we are all individual learners, and we need different environments and techniques to bring out our abilities. It is difficult to say how our homeschooling time differs from our life time. I can see my children learn on so many levels in a single activity, whether it is something that I organized for them or not. Usually it is an activity that was created entirely by themselves that gives them the most deeply learned experiences. My role is to give them a certain amount of awareness, or acknowledgement, of what they came to know. Sometimes. Sometimes it is better to just be around and be supportive. I mean, I am building a house, and I take my opportunities to get busy… and at times when I am just starting to feel guilty at leaving them undirected, I suddenly realize that they have laid the kitchen floor with little white tiles, or they are building a miniature cob house out of my plaster, and I realize that by taking up my own work I am teaching them more than I imagined about the process of manifesting dreams. So the journey continues. Life continues. Seasons sweep through us and offer new worlds to explore. There are stumbling blocks and slips and falls sometimes, but these are the places where we can learn more deeply about ourselves. My children are precious to me, and I will take the road that honours them the most, while honouring myself along the way. Thanks for getting in touch about homeschooling! We are always excited about meeting other kids from other islands. 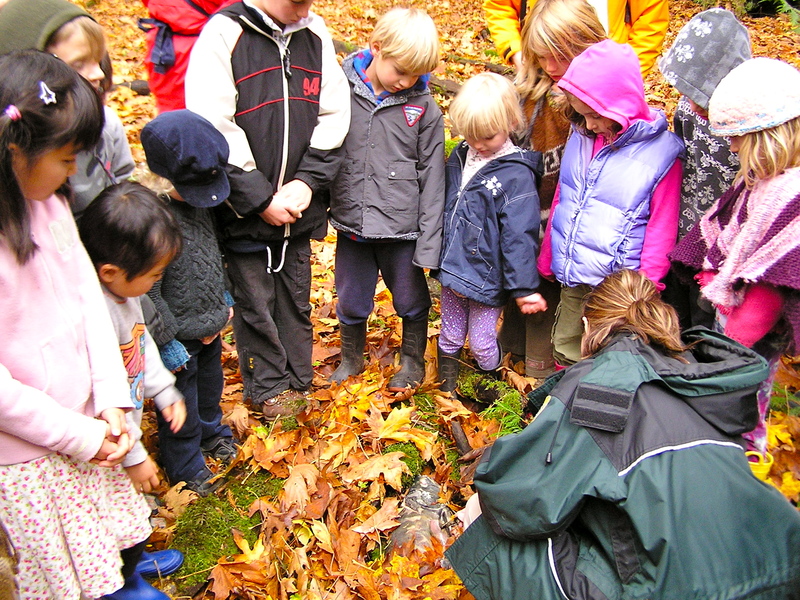 We are involved with Spring Leaves here on Pender, and this year we have almost 20 kids ranging from ages 5-12. We meet twice a week, on tuesdays at the school and on wednesdays either at the school, at our own homes, or somewhere on the island or for field trips off the island. Each child that attends is registered with the program and so receives resource money and time with our facilitator looking at learning plans and reports for the school. You are welcome to come for a visit sometime and join our activities! It would be great to meet you and your daughter. Wendi. Hi Michele! We are just setting up ideas and plans for our time together as a group, and I think we could certainly let you know when we are planning field trips. We gather weekly on wednesdays for a variety of activities… If you like, I can pass your email address on to our facilitator and perhaps she can add you to any notices about our plans. I am sure we can make a connection! We’re on SaltSpring. My son’s with Self Design too, and our “LC” said that her search for nearby SelfDesigners led to you! She said your SD email would pop up were I to type your name into the “to” field… but it is a glitchy program, and of course didn’t work. So I find you here, instead. I was hoping we could maybe go to Pender together one of these days, and let our kids participate in the awesomeness they seem to have going-on, over there. Tuesdays are with kids only, Wednesdays with parents, it looks like. The message we got from our “LC” said that you are part-time on Salt Spring. Maybe if you’re ever here on a Wednesday morning, we could pop over to Pender together, and check it out. I am CAR-less, which is okay for some things (ie. we’re right in town on Salt Spring, so can walk to most events and shops), but a hassle, for trying to get off-island. Anyways, you can reach me more steadily at leanneandsylvan@gmail.com. Please do! Neat that you’re trying out home-based learning this year. And SelfDesign is a great program. We can certainly (try to remember to) keep you in the loop, especially for field trips to Saturna or off-island. The first big event we have coming up is a presentation in the Pender School gym on Wed Oct 16 at 1:30 of Aché Brasil. I’m sure you’d be more than welcome to come over for that, if the ferries work out for you. You can let me know at greenhearted at shaw dot ca if you decide to attend. I am interested in attending one of your Wednesday meetings. I am homeschooling my children. I have 3 kids and we live on Mayne. We are very curious about exploring possibilities. Would love to hear from you. 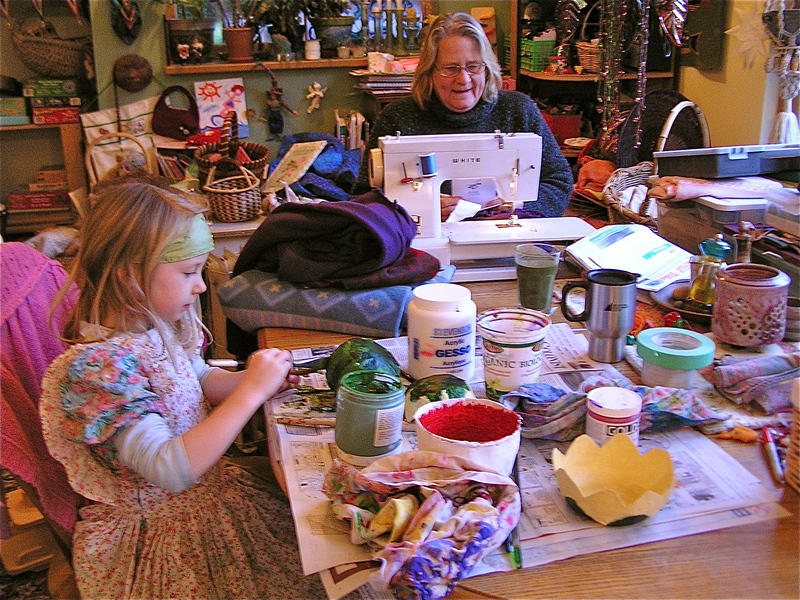 Funny how there is more ‘visibility’ of home/unschooling groups on the “outer islands” than on Saltspring. 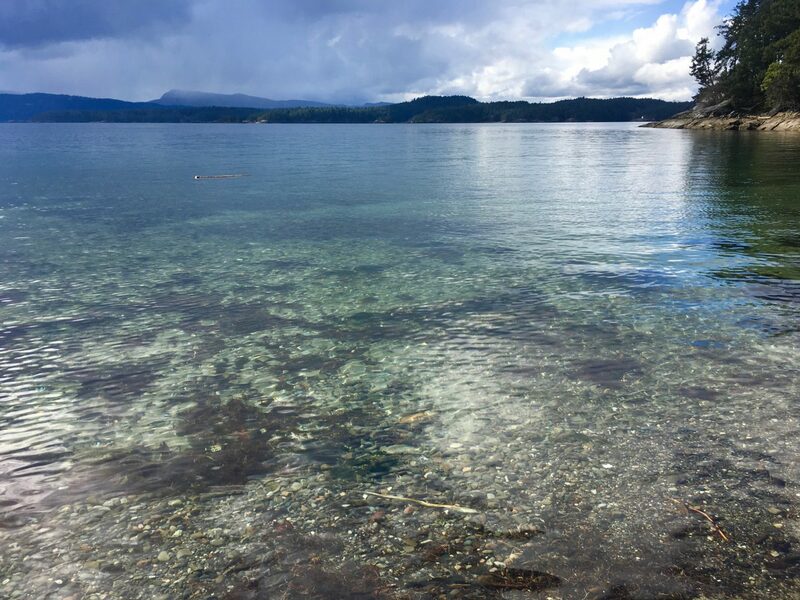 My son and I are new to Saltspring, and thought home/unschooling would be BIG, here! We’ll keep lookin’, but it would sure be nice to get together with some kids, sometime soon!! “HAVE CHILD, WILL TRAVEL!” It looks like there are regular meet-ups on Pender, so we’re ready to hop on a ferry, whenever we need to. I am looking to connect with other parents on or around Saltspring. I havent explored the other gulf islands much and am totally into it. I would love to meet some parents before the move. We are currently in Nanaimo, so not too far away and we travel to saltspring quite often.